MIDLAND. Dec 9. 2016 – — Tony Tepsic doesn’t have a Twitter account but, if he did, he would tell Donald Trump just when and where to find him. Tepsic, president of the United Steelworkers Local 1212 in Midland, took offense to the fact that the president-elect earlier this week attacked a fellow United Steelworkers local president in Indiana. The feud started when Trump claimed he helped save 1,100 jobs from leaving Indiana. Chuck Jones, president of United Steelworkers Local 1999 based in Indianapolis, called Trump a liar and said the real number of jobs saved was around 800. For Trump, it was just another 15 seconds on Twitter. Jones, however, started receiving anonymous phone calls that threatened his children. Locked out ATI Flat-Rolled Division workers and family members yell at a tractor-trailer truck driver leaving ATI’s Vandergrift plant during a family picket at the entrance to the plant on Wednesday, Nov. 4, 2015. Nov. 5, 2015 – Anyone going in or out of the ATI steel plant in Vandergrift on Wednesday evening drove through a wall of emotion. The union workers, whom the company has locked out of their jobs since Aug. 15, were in greater numbers than usual. That’s because the Wives of Steel, a group of steelworkers’ wives, called a rally at the plant entrance that started at 4:30 and continued for at least two hours. About 200 steelworkers and their families, most carrying signs demanding a fair contract from ATI, stayed on the move as they picketed. They walked back and forth — slowly — pausing on the driveway when vehicles approached the plant entrance, forcing them to slow down. “Do you think they get the idea that we don’t like what they’re doing?” asked Russ Gainor of West Leechburg, who attended the picket line, even though he retired from ATI in June after 36 years rather than risk the lockout. A thick white line freshly painted across the edge of the driveway served as the plant’s boundary from the public sidewalk. As the steelworkers rallied on one side of the stripe, ATI security guards in khaki uniforms and ball caps videotaped the proceedings from inside the plant property. ATI spokesman Dan Greenfield said the company had no reaction or comment on the rally. 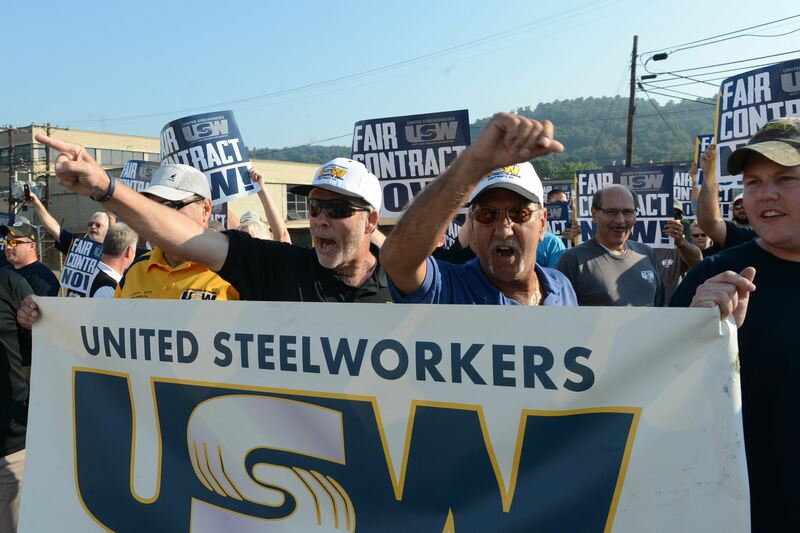 Regina Stinson of New Kensington, who heads the five-member Wives of Steel at United Steelworkers Local 1138 in Leechburg, said the large turnout is an indicator of the stress the steelworkers and their families are dealing with. The lockout enters its 83rd day Thursday. While some of the locked-out workers have found temporary work, many are receiving only unemployment compensation, which is a fraction of what they normally earn. Yesterday, in Lorain Ohio, hundreds of workers and supporters joined U.S. Senator Sherrod Brown, and Rep. Marcy Kaptur to tell America that we need to Save Our Steel jobs. The Alliance for American Manufacturing (AAM) is bringing the issue of a surge of illegally dumped oil tubular goods (OCTG) imports, primarily from South Korea, is flooding the U.S. market. These foreign steel pipes are priced below fair value and in deceptive ways are designed to circumvent international trade laws. U.S. workers and their communities deserve a fair shot. The United States has trade remedy laws that serve as the last line of defense for American firms and workers in the face of illegal trade. But when the rules are not effectively enforced, U.S. producers lose sales and profits, workers lose their jobs and communities lose homeowners and a sustainable tax base. Watch for future planned rallies and join us in Granite City, IL; McKeesport, PA; Longview, TX; Fairfield, AL and in the iron range in Minnesota. Calling all activists! We have a busy day ahead of us on Thursday, April 24, starting with a noon rally in Market Square for fair wages for women and low wage workers, then to support postal workers at Staples on McKnight Road, the to the Pump House for the first film of the season: Sacco and Vancetti! Top it off on Saturday afternoon at the Pump House for a discussion on the fight for meaningful immigration reform. Join us! Thursday, April 24 from 12:00 to 1:00 pm The Equal Pay Rally is on at Market Square. The rally will focus on the minimum wage, the impact of the gender wage gap on Pittsburgh families, and economic justice for all. The students of the Women and Girls Foundation (WGF) GirlGov program will have an Equal Pay Bake Sale at the rally to help illustrate the wage gap. Men will be charged $1 per item, and women will be charged 75 cents to exemplify the impact economic discrimination has on every aspect of our daily lives. We also are going to have "Will Work for Equality" t-shirts. Thursday April 24, 2:30 PM – 6:30 PM, Rally in support of postal workers! At STAPLES, 4801 McKnight Road, Pittsburgh, PA. 15237. Demonstrations will occur at Staples stores across the country on April 24 to protest the deal between Staples and the U.S. Postal Service that jeopardizes mail service and thousands of good jobs. The deal takes living-wage USPS jobs and full service U.S. Post offices and replaces them with knock-off post offices at Staples staffed with low wage employees. This is privatization and a race to the bottom for customers, workers and our communities. The Staples deal is bad for the consumers who will pay the same for less service. The public has a right to post offices and services that are staffed by uniformed employees that are accountable and sworn to safeguard your mail.